"Every time you have a big party, all that remains are the wine stains. And sometimes it's beautiful." ~ Daniel Boulud. The laughter too. The laughter remains. I hope that part doesn't ever fade. For two Saturdays my house rang with laughter. The hearty kind that comes from friendship and wine, story-telling and comfort, lives led in pursuit of more than just happiness and good food. I should write two posts here because there were two dinners. Or maybe because there are two styles of writing that need to be employed to get you into the room with us. Or perhaps because there was just so much going on. Instead, I'll try to mash it all together and you'll just have to believe me when I tell you that it all happened...and that you missed one hell of two dinners. And I'll share some how to. We begin with the geek in his natural element, standing in the middle of throngs of asparagus-seekers, my stalks already selected, the shitakes from the mushroom lady in my man-purse-European-carryall, and the thought of NY Strip sliced thin and cooked hot with a dash of soy in my mind. I heard a voice. "So what time are we coming over?" And with that, it was dinner party season again. Sue doesn't live here anymore (and that's all her fault) but she pops in to town about once a month for work. That is frequently enough to see and be seen. And to hear that the kitchengeek likes to cook. And she's bold. And I was talkin' about good food. It started, you see, at a market. I am convinced that food is not the only thing you bring home from Waverly anymore. Coaches talk about the intangibles, pollsters the "it" factor. I just looked around a table full of friends old and new for two weeks and reminded them that but for the corn meal (WV) and some pantry staples (butter, broth, salt/pepper/etc.) 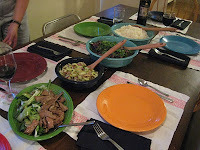 this week and the balsamic vinegar and pantry last week, everything was fresh. Not just from the market, but from as close as I could get it. The asparagus and the strawberries in each week's dinner were from the Shore ('hon). 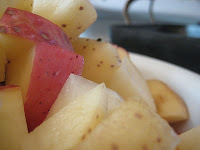 The potatoes were Baltimore County grown this week. The beef and the chicken used to graze and scratch less than 100 miles away from where I type this very moment. The wine? That's another story. Cava for bubbles at an auspicious occasion such as the first spring dinner, Louis Latour that pops brought at Christmas Eve that was never consumed (HOW did that happen? ), Brian Carter Cellars with Termprenillo blends & Petit Verdot blends last week and a Riesling/Vigonnier blend last night. What? Pocahantski brought more Cava for the second weekend? The Quiet One (who was in attendance and NOT living up to her name at last night's dinner) graced us with her presence and some seriously amazing Bordeaux (Chateua Thebot from 2001) and a 2006 St. Innocent Pinot Noir that disappeared much too quickly for me to have a taste. That's okay, Kim warned me to take some salad when I finally sat down for the the second dinner and I told her I'd get some later...I didn't pipe up when I saw Ms. Vertical scooping the final leaves out of the bowl. There were improvements (not on the food or company of course, but on the logistics). There was that moment when we finally realized we needed someone to bring still and sparkling beverages NOT made from fermented grapes. Thankfully there were two more people at dinner week two so there were two more things that could be asked of guests. Ms. Kim got water duty. Scored big by bringing the lemon and lime to go with the waters. Bueno, Kim. Bueno. What did we ask Scott to bring? We just asked Scott to take the damn Tupperware of potatoes home with him. Week before that the prize was given to Jeff. Jeff got to learn how to make whipped cream (chill the bowl people. chill the bowl) and a balsamic reduction. His lady pal got to talk to the other lady friends and howl with laughter while we whisked and stirred in the kitchen. 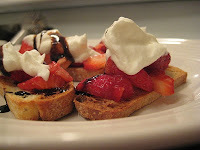 When we were done, there was dessert bruschetta. A crispy rosemary ciabbata wafer topped with mascerated strawberries from Preston on the Eastern Shore, some of that just-made whipped cream, and a drizzle or three of balsamic reduction. At the end of it all, there was Ms. Vertical and her joy, or the licking of the reduction pan. Pam and Jeff, this one's for you. Our second Saturday featured some polenta with a dash (or several cups) of shredded Parmesan next to roast potatoes (you heard about those above) next to roast chicken that had until just before dinner served as the chapeau of the potatoes. 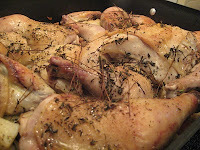 Hence the bath of chicken fat and olive oil. And the flavor. The cheese in the polenta was, if you believe in such words, potentially excessive. And it was the real stuff (Thx Pocahantski). 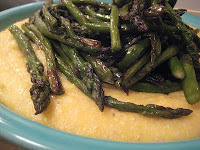 I haven't made polenta since the first UGK back in the day. Just re-read some of that and realized it might be time for Fruited Coucous Salad with Tarragon/Buttermilk dressing again soon. Just sayin'. Enough for eight - and this is by sight/feel so don't ask for exact measurements. Get comfy with watching your food to know when you've added enough. But we digress to telling you about the food that has already happened. The first meal was about the first fresh asparagus and the first local strawberries. But it was also about a memory for me. Sarah, Daniel, Jake, Amber or any of the others there probably don't remember this dinner. It was a summer day circa 1994 and we were heading back from Blue Hole. There was a grocery store run. Before I knew about technique or farming; before I ever owned my own pan or knife. 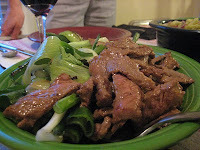 We all headed back to my house and I whipped up a massive pile of stir-fried freshness that turned a couple of heads. I guess all that chopping and stirring for Mom paid off earlier than I thought. There was ginger there, and there was ginger here last week. I knew it was in the fridge but not how much I'd rely on it until I took a glance at the volume of soy sauce remaining in my small bottle. Right...marinade for the steak goes the soy. The veg gets close to a cup of minced fresh ginger and almost the same amount of minced garlic. I'll leave you with dessert. As I should. The final course in this two-Saturday extravaganza separated only by short flow of time and a quick trip to pick up my new dining room chairs and bar console. 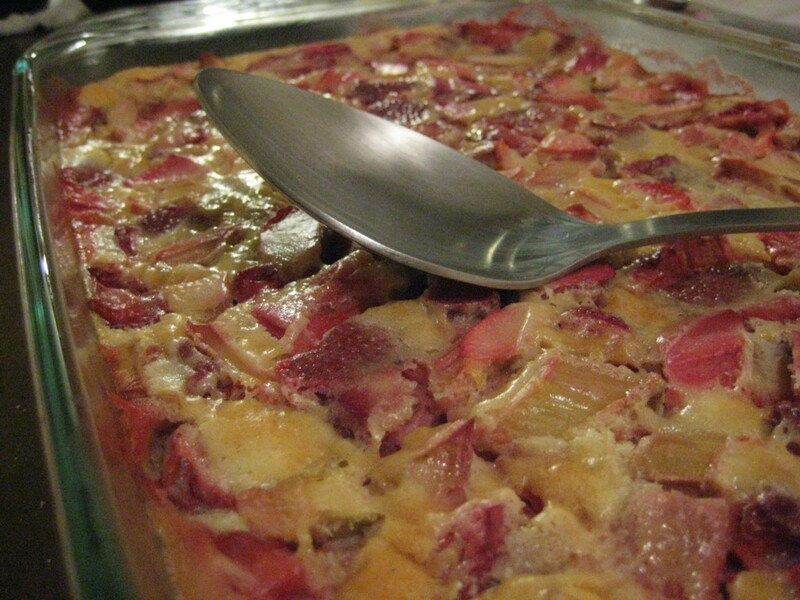 I'll leave you with the knowledge that tripling the recipe for Raspberry Clafoutis in the April 2010 Food & Wine magazine, transferring it to a 9x13 baking dish, and substituting strawberries and rhubarb is STILL the same dessert as the magazine. But forgetting the confectioners sugar makes it your own creation. Substituting real pistachio ice cream from the same folks who brought us multiple pounds of chicken leg quarters and NY Strip Steaks? Priceless. I started off with wine stains and laughter. And that's what I'll end with too. The place mats are in the wash, the wine bottles (all of them) are on the curb in the blue bin (filling the whole thing), the dishes are put away, and the new chairs are keeping the table company in the almost finished dining room. I think, perhaps, that it's only ever really 'finished' when there are smiles and glasses, laughter and forks, stories and stains painting the walls. I like to think that starts in the kitchen or at the market when I smell something, taste a new crop of something we haven't seen fresh and local in a year, or read a recipe and think 'I bet X and Y would love that.' I like to think that. I also know with a little smile for the stains I know I didn't get out of the place mats, that it's really at the table where it all finally comes together.